I posted about the American Glory quilt top I pieced, and as I was working on it I wondered what the pattern would look like if it was smaller. 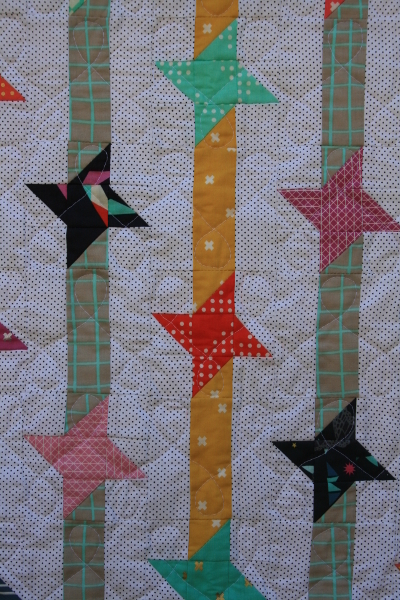 I also thought it would be interesting with a scrappy spin on the fabric choices, so I reduced the blocks and pulled out some scraps. Next I decided to have each vertical strip be consistent, but to alter the fabrics in the strips. 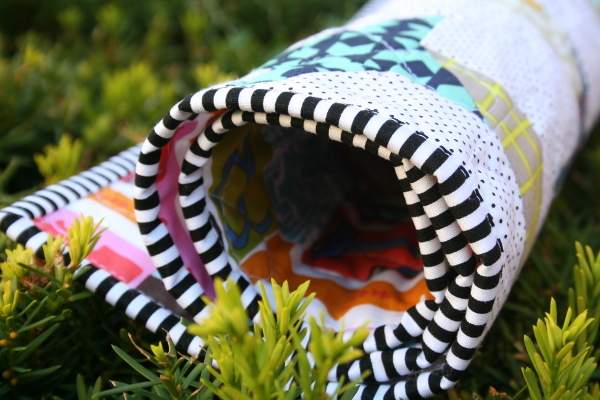 I selected fabrics with grays and yellows in them, to offeset the bright colors of the stars. Where possible, I cut long strips and pieced them the same way I did in my large version of this quilt. Once again, I used a tiny polka dot for the background. These strips were all cut at 1.75 inches wide. For strip piecing I cut them 18 inches long; where I had to find scraps I needed pieces that were 1.75″ wide by 4.25 inches long. 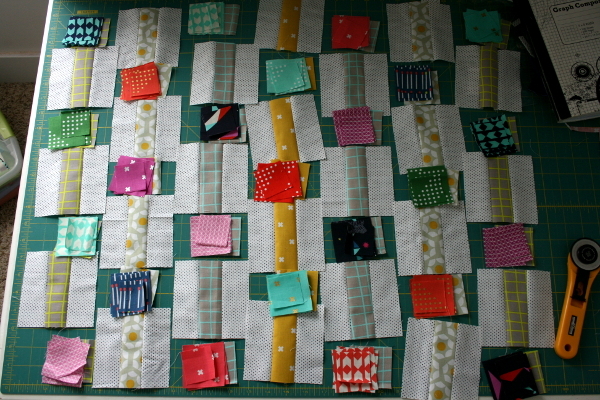 My mini quilt is made with 7 rows of 7 blocks, so some vertical columns needed 4 stripe blocks and others needed 3. From each of these fabrics (the stripes) I also needed 3 or 4 – 2.25 inch squares for the half square triangles in the star block. 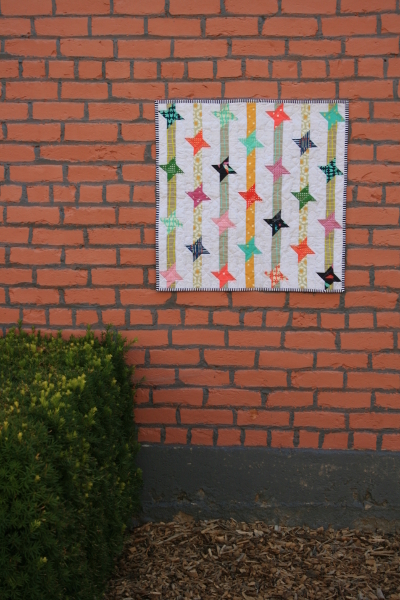 Once the stripe blocks were finished, I placed everything where I wanted to be certain I was pairing the proper background stripe with each star to make the half square triangle blocks. 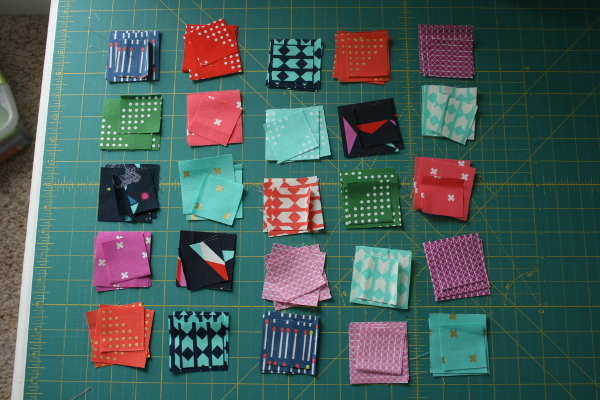 I chain pieced as much as I could without confusing myself too much, and it came together fairly quickly. I will say that the arranging of all the fabrics did make this version take much longer than the larger version did, where I had only two fabrics to worry about, but the results were worth it. As with the larger quilt, I found it far simpler to piece the the top together in vertical rows. Joining the rows together was fast with fewer seams to match because the stripes were already taken care of. The results, however, were worth it! 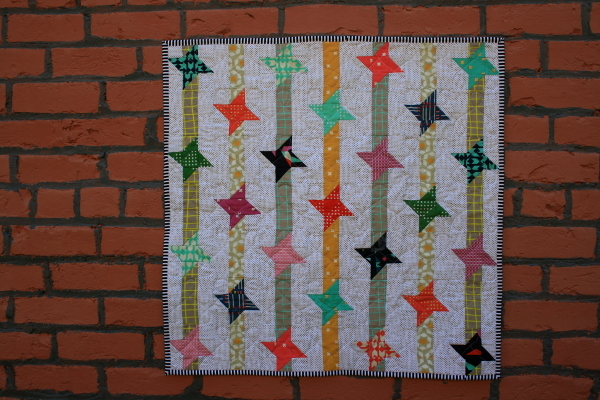 I like this pattern much more in miniature – the negative space doesn’t bother me so much, and the stars really stand out against the more neutral stripes (another change from my first version). These scraps are also a reminder of a special project, and of thoughts & feelings I don’t want to forget, so I’m glad to have them in this mini quilt. It now hangs in my laundry room, where I’ve claimed a wall for hanging minis. I quilted it in loopy horizontal rows. 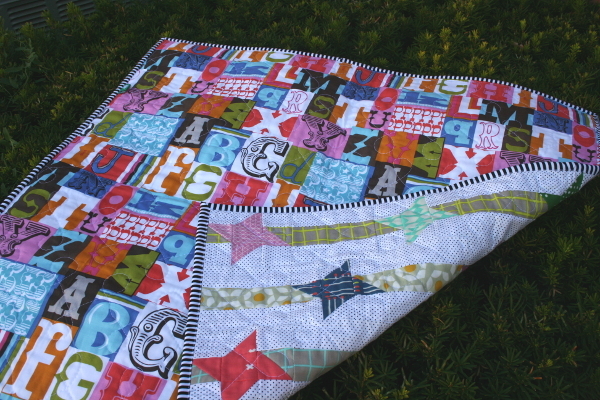 The backing is an alphabet print from Maude Asbury which I think compliments the Cotton + Steel fabrics nicely. Once again, a black and white binding is the perfect finish for this colorful project. This mini quilt measures almost 27 inches square. Each block is 4.25″ square, so they’re nice and little! This is the second mini quilt I’ve made, and I’ll admit that before I made one I wasn’t sure I thought they “counted” as a finished quilt (why do I do things like that?!?). They seemed too small and easy. 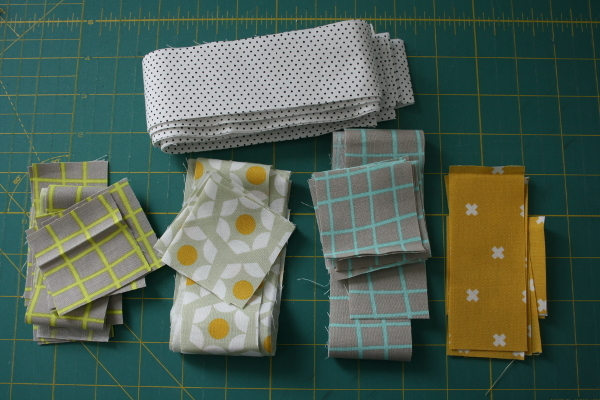 Having made this mini quilt and my mini hexagon beehive quilt (one of my favorite projects ever! 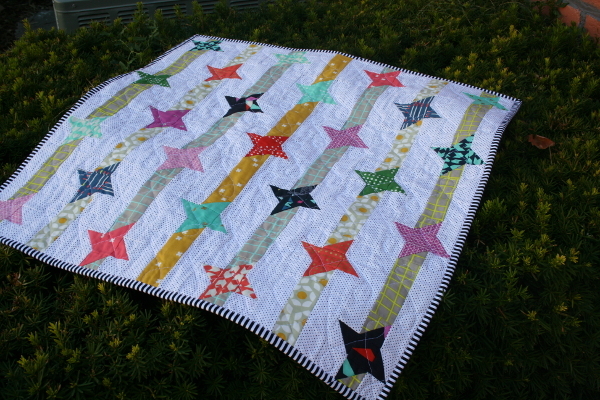 ), I’ve learned that tiny means time, and both of these quilts took honest effort to make. While the quilting of them is very quick, dealing with such little pieces requires patience and careful piecing for accurate results. SO, they totally count! This is the cutest ever! !!! I love it in the mini version.